Whichever sport you play, MY3D can create a photorealistic 3D Selfie printed on our Projet 660 full colour printer. Your 3D Selfie is a piece of art that you will cherish for a lifetime and can be from 3 inches to 14 inches in height. Get scanned today and have yourself delivered direct to your front door! MY3D can create a lifelike 3D print of yourself and the process has never been so easy. Visit our Dundas St E. showroom to get scanned, or if you are part of a team the MY3D mobile scanning system can set up at your venue to scan your entire team. 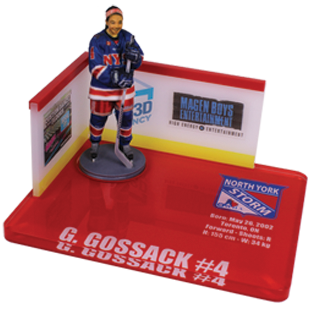 We will design a personalized acrylic base that will be reflective of your team & sport. Seen enough? Excited? Ready to Book?